An illumination system for flash photomicrography. Click for annotated diagram. Introduction: The properties of Xenon flash illumination. A simple flash setup for low power photomicrography. The construction of a flash lamp providing Köhler illumination. The optics of the Köhler flashlamp and light source size. The determination of flash exposure. Methods of supporting the camera. Incident light flash using acrylic fibre optic light guides. Electronic flash has been generally available to photographers since the 1950s and its advantages are well known. These benefits are even more attractive in photomicrography, where the requirement for intense illumination is greater than in most other forms of photography, and the need to freeze motion is also great, as even the most leisurely of micro organisms becomes a high speed object at high magnification. Yet in spite of its obvious suitability, there have been few serious attempts to adapt electronic flash to the light microscope, and even those attempts did not win wide acceptance. True, a certain level of optical sophistication (and therefore expense) is required to make it work, but appropriate optical components are now available off the shelf from most optical suppliers, and the engineering required to fit them together is fairly basic, given access to a lathe. It is therefore possible for the microscopist having basic engineering and electronics skills/resources to construct a highly effective dual-source flashlamp suitable for Köhler illumination. This article deals with the practical considerations involved in various approaches to photomicrography using flash in the hope that it will be of assistance to those wishing to construct their own setup. From the OEM point of view, the thyristor control of flash duration, and therefore flash exposure, is now a mature technology, and the production of a more sophisticated apparatus allowing the automatic determination of flash exposure in both silver-based and digital photomicrography would seem to present no particular problem. It is hoped that some manufacturer out there would see commercial advantage in offering an affordable apparatus to the community of light microscope users. The Properties of Xenon Flash Illumination. In this article, the term electronic flash refers to the commercially available units supplied by photographic dealers for normal photography. A flashtube and reflector assembly from a small battery-powered flash unit is shown on the left. WARNING. Electronic flash equipment stores electrical energy at high voltages and releases it in a very short, intense burst. The electrical shock delivered by even quite small units can be severe, and larger units can kill. Do not attempt any modifications to flash equipment unless you are quite sure of the risks you are running, and have suitable backup in the event of an accident. 1. All of the light necessary for the exposure of the film is delivered in a thousandth of a second or less. This has the advantage that even rapidly moving subjects are rendered sharply, and subject movement caused by camera vibration is also greatly reduced. It has the disadvantage that, in the absence of a useful level of ambient light, some additional light source must be provided to enable visibility of the subject between exposures. In studio photography, this is called the modelling light and is used to set the shot up for the flash exposure. Ideally the modelling illumination should come from exactly the same source and/or direction as the flash source to ensure that the flash exposure will be identically lit, and it is this requirement which poses particular difficulties in the case of the microscope. 2. The light from electronic flash is of approximately daylight quality, and remains of daylight quality over a wide range of light output. This eliminates (or greatly reduces) the need for colour correction filters when using daylight film, and, unlike tungsten illumination, the filtration requirement does not change (much) with change of intensity. (There is a tendency for the light to shift towards blue as the tube is powered at higher current densities). Variation of colour temperature with filament current is one of the main problems in photography using incandescent lamps, and can only be compensated by continually changing filter packs between light source and subject. 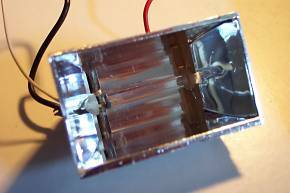 In practice, the lamp is left to run at constant current/voltage, and the intensity is modulated using neutral density filters of various kinds. Additionally, the light microscope requires that the illumination intensity for the highest powers be many times greater than that required for the lowest powers, so colour temperature constancy represents another great advantage of electronic flash as an illuminant in photomicrography. 3. Most of the energy of the light emitted by a tungsten filament is in the red and infra-red part of the spectrum, and this poses a serious threat of overheating when light is concentrated onto the microscope specimen at the high intensities required for short photographic exposures. Many creatures will not behave normally even at intensities well below this level. By contrast, the light from a xenon flash tube has very little heat component, and light-sensitive organisms can be observed and framed at low levels of modelling light intensity -- the flash discharge raises the light level to a photographic intensity only for the moment of exposure. The resulting photographs show these creatures in a way much more representative of their natural behaviour. In cinemicrography, the reduced heat load of electronic flash provides a similar advantage over conventional continuous light sources. 4. Xenon flash tubes are more efficient in terms of light output per unit power (Lumens/Joule) than illumination from incandescent tungsten filament lamps. This is not of particular importance in still photomicrography, but represents a greater advantage in cinemicrography. The main problem that must be addressed in order to adapt electronic flash to the microscope is that of combining the light from the flash with the light from the modelling source. A simple method of achieving this which is suitable to photomicrography with low power objectives is described on the following page.